For many people the existence of God is by no means a sufficiently clear feature of reality. This problem, the fact of divine hiddenness, has been a source of existential concern and has sometimes been taken as a rationale for support of atheism or agnosticism. 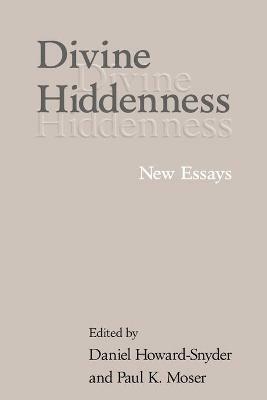 In this collection of essays, a distinguished group of philosophers of religion explore the question of divine hiddenness in considerable detail. The issue is approached from several perspectives including Jewish, Christian, atheist and agnostic. There is coverage of the historical treatment of divine hiddenness as found in the work of Maimonides, St. John of the Cross, Jonathan Edwards, Kierkegaard, and various Biblical writers. A substantial introduction clarifies the main problems of and leading solutions to divine hiddenness. Primarily directed at philosophers of religion, theologians, and scholars of religious studies, this collection could also serve as a textbook for upper-level courses in philosophy of religion. List of contributors; Introduction. The hiddenness of God Daniel Howard-Snyder and Paul K. Moser; 1. What is the problem of the hiddenness of God? Peter van Inwagen; 2. What the hiddenness of God reveals: a collaborative discussion J. L. Schellenberg; 3. Deus absconditus Michael J. Murray; 4. St. John of the Cross and the necessity of divine hiddenness Laura L. Garcia; 5. Jonathan Edwards and the hiddenness of God William J. Wainwright; 6. Cognitive idolatry and divine hiding Paul K. Moser; 7. Divine hiddenness: what is the problem? Jonathan L. Kvanvig; 8. A Kierkegaardian view of divine hiddenness M. Jamie Ferreira; 9. The hiddenness of God: a puzzle or a real problem? Jacob Joshua Ross; 10. Seeking but not believing: confessions of a practicing agnostic Paul Draper; 11. The silence of the God who speaks Nicholas Wolterstorff; Bibliography; Index of names; Index of subjects. Paul K. Moser is Professor and Chair of Philosophy at Loyola University Chicago. He is the author of The Elusive God (Cambridge, 2008) and The Evidence for God (Cambridge, 2010), editor of Jesus and Philosophy (Cambridge, 2008), and co-editor of Divine Hiddenness (Cambridge, 2002) and of The Rationality of Theism (2003). He is also editor of the journal American Philosophical Quarterly.